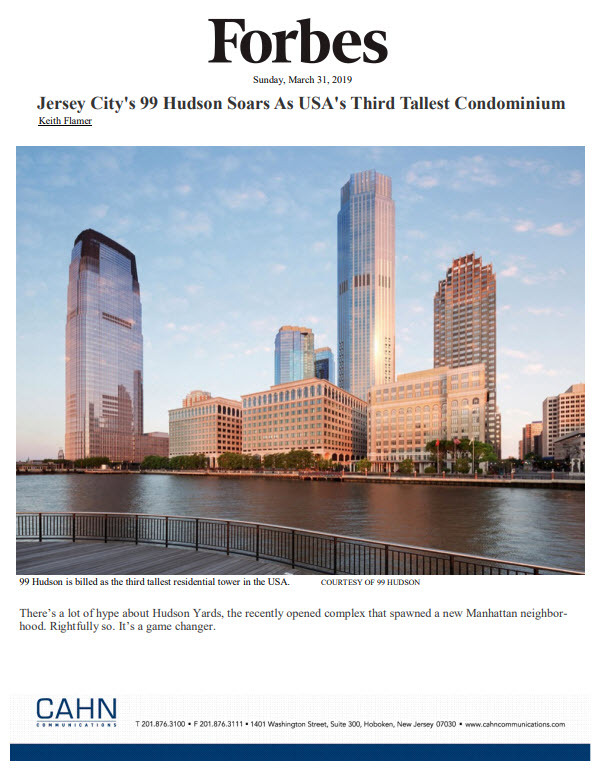 JERSEY CITY, NJ – One of the most successful residential developments in the region is expanding yet again with the launch of Criterion, a new offering of 271 luxury apartments located within The Beacon in Jersey City. Rising 18 stories above The Beacon’s elevated site overlooking the Manhattan skyline and Liberty State Park, Criterion offers a new level of urban sophistication with modern studios, one- and two-bedroom residences complemented by well-thought-out amenities and services. Immediate occupancy is available. Criterion follows the successful lease-ups of four other luxury apartment buildings at The Beacon in the past few years, according to Building & Land Technology (BLT), which is developing the community’s collection of residences and incomparable indoor and outdoor amenities. Like the Mercury, Orpheum, Paramount and Tower buildings at The Beacon, Criterion’s exterior has been expertly restored to recapture the dramatic architectural details and historic grandeur of its Art Deco-era origin. Blending perfectly with Criterion’s historic spaces are brand new, modern residences with monthly rents starting at $1,750 a month. The apartments feature high ceiling heights, wood-style flooring, and Gourmet Chef’s Kitchens with white cabinets, granite countertops, Frigidaire stainless steel appliances and garbage disposals. Elegant baths are adorned with cultured marble vanity tops, tile floors and glass shower doors. Each residence also offers central heating and air conditioning, individual washers and dryers, and smart card key access. A full suite of private amenities and services within Criterion will further enhance residents’ daily lives. These include a state-of-the-art gym, 18th-floor Sky Lounge offering panoramic views, a Quiet Room, a children’s playroom, and a landscaped courtyard with seating, barbecue grills and a fire pit. Residents will also appreciate the building’s Package Concierge, an innovative, digital system that notifies residents when packages have been delivered and provides them with 24/7 access to their secured locker at their convenience. In addition to private amenities, Criterion residents will also enjoy The Beacon’s unrivaled open space, including the 45,000 square-foot Overlook Park offering panoramic Manhattan skyline and New York Harbor views, numerous grills and seating areas; an additional 2-acre park with children’s playground and organic garden spaces, and two expansive dog runs providing considerable outdoor space for canines. The substantial offering of recreation areas makes The Beacon one of the greenest urban residential communities in the region. BLT’s commitment to service is further demonstrated through a suite of exclusive benefits to Beacon residents, including courtesy shuttle transportation to the Grove St. and Exchange Place PATH/Ferry Stations, on-site parking, 24-hour on-site maintenance, Community Concierge and Smart Key Apartment access. The ActiveBuilding resident portal allows residents to pay their rent online, chat with neighbors, join activities and place service requests. Beacon residents also enjoy proximity to Jersey City’s vibrant downtown district which is celebrated for its comprehensive public transportation system, including numerous NY Waterway Ferry terminals and PATH stations offering convenient service into Manhattan, as well as NJ Transit Light Rail and accessibility to the Holland and Lincoln Tunnels and the New Jersey Turnpike. The area is also known for its active artist’s community, growing music scene, and ever-improving shopping, dining and nightlife venues. In addition, the new Citi Bike Jersey City bike sharing program will include a station at The Beacon. It is one of 35 stations city wide that will house 350 bikes to provide a new, environmentally friendly, healthy and affordable 24/7 transportation option for Jersey City. (877) 640-4945, or visit The Beacon’s website at www.thebeaconjc.com. The community’s Leasing Center is located at 126 Clifton Place (GPS – 20 Beacon Way), Jersey City, NJ 07304.